Loyal to the Word NOTE: In this address, Elder Talmage gave his effort at reconciling the gospel with his scientific understanding. 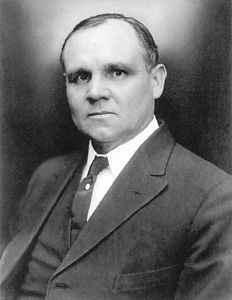 While by no means does Elder Talmage accept evolution in this address, he does concede some ideas that are not in harmony with the revealed word of the Lord, namely death before the Fall. Also, Elder Talmage here argues for an old earth, something that Loyal to the Word also feels is out of harmony with Revealed Writ. "In the beginning God created the heaven and the earth. And the earth was without form, and void; and darkness was upon the face of the deep. And the Spirit of God moved upon the face of the waters." (Gen. 1:1-2). Any question as to when that beginning was is largely futile because [it is] unanswerable. In the first place we have no time unit by which to measure back through the ages to the time at which, so far as the earth is concerned, time began. Years are as inadequate in any attempted survey of the stages of earth development as are miles to the astronomer who would span the distances of interstellar space. He speaks in terms of light-years, such unit being the distance traversed by a ray of light speeding on at the rate of approximately 186,000 miles per second throughout a year. Secondly, we are without information as to what stage of earth development is indicated by "the beginning." And what is a beginning in nature? At best it is but a new start in advance of what had passed up to that point of time; and every beginning is an ending of what went immediately before, even as every consummation is a commencement of something greater, higher, and therefore superior to the past. To the thoughtful mind there can be no confusion of the beginning spoken of in the opening verse of genesis with the advent of man upon the changing earth; for by the scriptural record itself we learn of stage after stage, age after age of earth processes by which eventually this planet became capable of supporting life -- vegetable, animal and human in due course. Whether or not scientists have been able to see, however dimly, the way by which the earth as an orb in space was formed, matters little except as a subject of academic interest. For many years it was very generally believed that the earth, once formless and void, passed through stages of cooling of superheated gas to liquid, thence to the solid state, as the Nebular Theory assumed; but this conception has given way to the later thought that the earth as a solid spheroid has resulted from the bringing together of particles once diffused in space -- this being the basis of the Planetesimal Hypothesis. But this we know, for both revealed and discovered truth, that is to say both scripture and science, so affirm -- that plant life antedated animal existence and that animals preceded man as tenants of earth. What a fascinating story is inscribed upon the stony pages of the earth's crust! The geologists, who through long and patient effort has learned at least a little of the language in which these truths are written, finds the pages illustrated with pictures, which for fidelity of detail excel the best efforts of our modern engravers, lithographers and half-tone artists. The pictures in the rocks are the originals, the rest at best but copies. In due course came the crowning work of this creative sequence, the advent of man! Concerning this all-important event we are told that scientists and theologians are at hopeless and irreconcilable variance. I regard the assumption or claim, whichever it be, as an exaggeration. Discrepancies that trouble us now will diminish as our knowledge of pertinent facts is extended. The creator has made record in the rocks for man to decipher; but He has also spoken directly regarding the main stages of progress by which the earth has been brought to be what it is. The accounts can not be fundamentally opposed; one can not contradict the other; though man's interpretation of either may be seriously at fault. So far as the history of man on the earth is concerned the scriptures begin with the account of Adam. True, the geologist does not know Adam by name; but he knows and speaks of man as an early, continuing and present form of earth-life, above and beyond all other living things past or present. We believe that Adam was a real personage, who stands at the head of his race chronologically. To my mind Adam is a historic personage, not a prehistoric being, unidentified and uncertain. If the Usher chronology be correct, or even approximately so, then the beginning of Adamic history as recorded in scripture dates back about 4000 years before the birth of Christ. We as a Church believe that the current reckoning of time from the birth of Christ to the present is correct, namely 1931 years -- not from last New Year's day, January 1, but from the month that came to be known among the Hebrews as Nisan or Ahib, corresponding with our late March and early April. So we believe that we are now living in the 1931st year since the birth of Christ, and therefore 5931 years since the beginning of the Adamic record. There has been much discussion over the alleged conflict between the teachings of science and the doctrines of the revealed word concerning the origin of man. Let it be remembered that the term origin is almost invariably used in a relative sense. The mind of man is unable to grasp the fundamental thought of an absolute or primary origin. Every occurrence man has witnessed is the result of some previously acting cause or purpose; and that cause in turn was the effect or result of causes yet more remote. Perhaps we have never been able to trace an effect to its primary or original cause. Man may say that he understands the origin of an oak in the acorn form from which it sprang; but is not the acorn the fruit of a yet earlier oak, and so in reality rather a continuation than a beginning? Yet there is something fascinating in the thought of a beginning; the persistence of a process once started is far less mysterious than its inception. It is not enough to refer effects to the First Great Cause; it is unsatisfying and not always reverent to answer questions as to how things came to be what they are by the easy statement that God made them so. With such an answer the scientific man has little patience. The fact that all created things are the works of God and that all processes of nature are due to Him as the administrator of law and order is to the scientific mind an axiom requiring neither argument nor demonstration. The botanist knows that God makes the plant grow; but he, weak mortal, is devoting time and energy of body, mind and spirit, to a study of the way in which God works such a marvelous miracle. The geologist knows that God created the earth; but the best effort of his life is put forth in the hope of finding out in some degree, however small, the method by which the Creator wrought this wondrous world. The astronomer gazing into the starry depths sees in their orderly procession the Lord Eternal walking in His majesty and might; and in humility the student of the heavenly bodies spends days and nights striving to learn a little of the way in which God worked out the marvel of the universe. In proportion as any one of these may learn of the ways of God he becomes wise. To be able to think as God thinks, to comprehend in any degree His purposes and methods, is to become in that measure like unto Him, and to that extent to be prepared for eventual companionship in His presence. The scientist is busily engaged in the study of secondary causes -- the ways and means by which God works and through which He accomplishes His miracle, ever beginning, never ending -- and in his search for the truth the student of science scarcely dares lift his eyes to look toward the First Great Cause, the Eternal Power that stands and operates behind and above all the secondary causes, or what we call the processes of Nature. The question involved in the origin of man, therefore, is not raised as a challenge to the belief and declaration that he came to earth through Divine direction, but it is in the nature of an inquiry as to the conditions under which he came. There are many who claim that man's advent upon the earth was effected through processes of evolution from lower forms, processes that had been operative for ages, processes by which man is made kin to the brute and a development from the lowest type of organism. Others affirm that he differs from all mortal creatures of lower rank, not only in degree but in kind; in short, that he is not one with the animal creation and that therefore his coming was in no sense a natural and necessary result of earlier animal life. Discussion on this question has developed intense animus, and too often the quest for truth has been lost sight of in the strife for triumph. In speaking of the origin of man we generally have reference to the creation of man's body; and, of all the mistakes that man has made concerning himself, one of the greatest and the gravest is that of mistaking the body for the man. The body is no more truly the whole man than is the coat the body. The man, as an individual intelligence, existed before his earthly body was framed and shall exist after that body has suffered dissolution. Let it not be assumed that belief in the existence of man's spirit is a conception founded upon scriptural authority only; on the contrary, let it be known that it is in accordance with the best and most advanced scientific thought and philosophic belief of the day to hold that man consists of spirit and body; and Divine revelation makes plain that these together constitute the soul. We have difficulty in comprehending processes for which we find no analogy in things familiar. Even were it possible for us to know in detail the way in which the body of man was formed and then endowed with the power of procreation, insuring the perpetuity of the race, it would throw but little light upon the subject of the ultimate origin of man. We know but little of things beyond the sphere upon which we live except as information has been revealed by a power superior to that of earth, and by an intelligence above that of man. Notwithstanding the assumption that man is the culmination of an evolutionary development from a lower order of beings, we know that the body of man today is in the very form and fashion of his spirit, except indeed for disfigurements and deformities. The perfect body is the counterpart of the perfect spirit and the two are the constituent entities of the soul. Much depends upon the standard by which we judge as to whether any particular organism shall be pronounced of high or lower rank. By the standard of powers of flight, in which the bird excels, man is a very inferior being; if judged by fleetness of foot he is far below the deer; by gage [gauge] of strength he is inferior to the horse and the elephant; and yet man holds dominion over these and all other living things of earth. In certain important points of body-structure man stands low in the scale if he be graded strictly in accordance with the accepted standard of mammalian anatomy. In the course of creative events the earth came to a condition fitted for the abiding place of the sons and daughters of God; and then Adam came forth upon the earth. But the beginning of man's mortal existence upon the earth was not the beginning of man; he had lived before, even as he shall life after the earth has passed away and its place taken by a new earth and a new heaven. It has been stated by certain extremists that evolution affirms that man is in the line of posterity from the ape. But scientists today discredit this view. The most that even radical evolutionists assert is that the similarity of structure between man and certain apes indicates the possibility of a common ancestor of the two but between man and the ape there are more essential differences than resemblances. "Whatever the results of further search, we may feel assured, in accord with Wallace, who shares with Darwin in the authorship of the theory of Natural Selection, that the intervention of a Power above nature as at the basis of man's development. Believing that Nature exists through the will and ever-acting power of the Divine Being, and that all its great truths, its beauties, its harmonies, are manifestations of His wisdom and power, or, in the words nearly of Wallace, that the whole universe is not merely dependent on, but actually is, the will of one Supreme Intelligence. Nature, with man as its culminant species, is no longer a mystery." James D. Dana, Manual of Geology, 4th edition, page 1036. These lines were written before the death of the writer -- and constitute his last testament and testimony as to the origin of the species to which he himself belonged. "Man was the first being, in the geological succession, capable of an intelligent survey of Nature and a comprehension of her laws; the first capable of augmenting his strength by bending nature to his service, rendering thereby a weak body stronger than all possible animal force; the first capable of deriving happiness from truth and goodness; of apprehending eternal right; of reaching toward a knowledge of self and God; the first, therefore, capable of conscious obedience or disobedience of a moral law, and the first subject to debasement of his moral nature through his appetites. "There is in man, therefore, a spiritual element in which the brute has no share. His power of indefinite progress, his thoughts and desires that look onward even beyond time, his recognition of spiritual existence and of a Divinity above, all evince a nature that partakes of the infinite and divine. Man is linked to the past through the system of life, of which he is the last, the completing, creation. But, unlike other species of that closing system of the past, he, through his spiritual nature, is more intimately connected with the opening future." -- Dana, pages 1017-18. Let me cite a later authority than Dana. Among the living no anthropologist has been more pronounced in upholding the theories of Darwin and Lamarck than Dr. Henry Fairfield Osborn. By the theories mentioned man was said to have risen from tree-climbing ape-like ancestors. In his address as retiring president of the American Association for the Advancement of Science, December, 1929, Dr. Osborn affirms the untenability of the views he had so long and aggressively advocated. He regards the human bones unearthed at Piltdown, Sussex, England, as typical of the "Dawn Man," who was in every distinguishing characteristic, a man, not part man and part ape, but as to brain capacity and other evidences of mentality equal to some races now living. Yet Osborn holds to a communal origin of man and anthropoids related in structure, away back in the late Tertiary age of geologic history. Thus theories come, endure for a season and go, like the fungi of the night; nevertheless they serve their purpose as temporary aids in human thought and endeavor. The outstanding point of difference between those who take the opening chapters of Genesis and cognate scriptures as a the whole and only reliable record of the creation of earth and man, and the students of earth-science who fail to find an adequate record in scripture, is the point of time during which man in some state has lived on the planet. Geologists and anthropologists say that if the beginning of Adamic history dates back but 6000 years or less, there must have been races of human sort upon earth long before that time -- without denying, however, that Adamic history may be correct, if it be solely regarded solely as the history of the Adamic race. This view postulates, by application of Dana's affirmation already quoted: "that the intervention of a power above Nature" brought about the placing of, let me say, Adam upon earth. It is but fair to say that no reconciliation of these opposing conceptions has been effected to the satisfaction of both parties. We have not yet learned how to correlate geologic time-periods with terms of years, except as estimates, for which no absolutely dependable foundation may be found. I do not regard Adam as related to -- certainly not as descended from -- the Neanderthal, the Cro-Magnon, the Peking or the Piltdown man. Adam came as divinely directed, created and empowered, and stands as the patriarchal head of his posterity -- a posterity, who, if true to the laws of God, are heirs to the Priesthood and to the glories of eternal lives. Were it true that man is a product of evolution from lower forms, it is but reasonable to believe that he will yet develop into something higher. While it is a fact that eternal progression is a characteristic of man's Divine birthright, as yet we have learned nothing to indicate that man shall develop physically into any other form than that in which he now appears. Many attempts have been made by those who regard man as an animal to frame some definition by which he may be distinctively described among his fellow animals; but of such attempts none have been satisfactorily successful. The difficulty lies in the fact already stated, that man differs from the animal creation not only in degree but in kind; he is the only being who has any conception of a preexistent state or an existence beyond the grave; the only being whose thoughts turn toward God and who feels in his soul the inspiring impulses of kinship to Deity. Believe not those who would make man but little above the brutes, when in truth he is but little below the angels, and if faithful shall pass by the angels and take his place among the exalted sons of God. The spirit of man is the offspring of the Eternal Father, and his body, if unmarred, is in the very form and fashion of that spirit. We have been told that Jesus Christ is in very truth our Elder Brother, and as to His preexistence in the spirit state there is little room for question. That His spirit was in the form of the earthly body which He afterward took, and which body was slain, buried, and resurrected, and with which body He ascended into heaven, is attested by scripture. Going back to the time immediately following the dispersion from Babel, we read of a prophet to whom the unembodied Lord revealed Himself, saying: "Behold, this body, which ye now behold, is the body of my spirit; and man have I created after the body of my spirit; and even as I appear unto thee to be in the spirit will I appear unto my people in the flesh." (Book of Mormon, Ether, 3:16). It is evident from this scripture that in His preexistent state, that is to say in the state in which He existed prior to His earthly birth, Jesus Christ had the same form and stature that He afterward presented in the flesh. By natural processes His spirit shaped for itself a body from the material of earth, which body underwent a course of graded development until it reached maturity, in which state that body was the counterpart tot he spirit whose material tabernacle it was. As with Jesus, so with all the sons and daughters of God; each had a spiritual existence before he entered upon this stage of mortal existence, and in each case the body is formed and fashioned by the power of the immortal spirit. In this process of body-shaping, the spirit may be hindered, hampered, and interfered with, through influences of heredity, through prenatal defects, or through accident and disease. As to how were formed the bodies of the first human beings to take tabernacles, the revealed word gives no details while science has practically nothing to offer by way of explanation. As Dana so positively declares in the work already cited "Man's origin has thus far no sufficient explanation from science." Man's mortal existence is but temporary to this earth; he came hither from another realm, in which he lived in an unembodied state and to which, in the natural order, he shall return in a disembodied state, following the change known as death. After the Body of the first man had been made ready through the direct operation of the creative power, the spirit of man entered that body. Note the sublimity of the scriptural declaration: "And the Lord God formed man of the dust of the ground, and breathed into his nostrils the breath of life; and man became a living soul." (Gen 2:7). "And God said, Let us make man in our image, after our likeness; and let them have dominion over the fish of the sea, and over the fowl of the air, and over the cattle, and over all the earth, and over every creeping thing that creepeth upon the earth. "And God blessed them, and God said unto them, Be fruitful, and multiply, and replenish the earth, and subdue it; and have dominion over the fish of the sea, and over the fowl of the air, and over every living thing that moveth upon the earth." (Gen. 1:26-28). Such is the declaration of scripture regarding Adam's advent upon earth; and such is a fair summary of our knowledge upon the subject. Man is the child of God, he is born heir to boundless possibilities, the inheritor of the eternities to come. Among mortal beings, the law holds true that the posterity of each shall be after his kind. The child therefore may become like unto the parent; and man may yet attain the rank of godship. He is born in the lineage of Deity, not in the posterity of the brute creation. I cite my words of an earlier day, with a quotation [neither the pamphlet nor the Instructor copy give the citation]. The insignificance of man in comparison with the earth on which he dwells, and even with the limited topographical features of his world, has oft times been dwelt upon. Draw to scale a towering mountain and a man standing at its base or on its summit -- what does the man amount to? But then the earth as a planet is small compared with some others of its own system, to say nothing of the relative sizes of earth and sun. In turn, our entire solar system, in the measurement of which miles cease to have meaning -- so vast it is -- ranks low in dimensions as we gage [gauge] it with other families of worlds in the great galaxy of stars to which it belongs, and that immeasurable galaxy is but one among many, and not the greatest of them all. "It was done; and, with a mighty angel for his guide, the man stood ready for his infinite voyage. Then, from the terraces of heaven, without sound or farewell, they wheeled away into endless space. Sometimes, with solemn flight of angel wing, they fled through Zaarrahs of darkness, through widernesses of death that divided the worlds of life. Sometimes they swept over frontiers that were quickening under prophetic motions from God. "Then, from a distance that is counted only in heaven, light dawned for a time through a sleepy film. By unutterable pace the light swept to them, they by unutterable pace to the light. In a moment the rushing of planets was upon them; in a moment the blazing of suns was around them. "Then came eternities of twilight, that revealed, but were not revealed. To the right hand and the left towered mighty constellations, that by self-repetitions and answers from afar, that by counterpositions, built up triumphal gates, whose architraves, whose archways -- horizontal, upright -- rested, rose -- at altitudes, by spans -- that seemed ghostly from infinitude. Without measure were the architraves, past number were the archways, beyond memory the gates! "Within were stairs that scaled the eternities above, that descended to the eternities below; above was below, below was above to the man stripped of gravitating body. Depth was swallowed up in height insurmountable; height was swallowed up in depth unfathomable. Suddenly, as thus they rode from infinite to infinite, suddenly as thus they tilted over abysmal worlds, a mighty cry arose -- that systems more mysterious, that worlds more billowy, other heights and other depths were coming, were nearing, were at hand! "And from all the listening stars that shone around issued a choral chant, 'The man speaks truly; end is there none that ever yet we heard of.' 'End is there none?' the angel solemnly demanded. 'Is there, indeed, no end? And is this the sorrow that kills you?' Then the angel threw up his glorious hands to the heaven of heavens, saying 'End is there none to the universe of God! Lo, also, there is no beginning!'" What is man in this boundless setting of sublime splendor? I answer you: Potentially now, actually to be, he is greater and grander, more precious according to the arithmetic of God, than all the planets and suns of space. For him were they created; they are the handiwork of God; man is His son! In this world man is given dominion over a few things; it is his privilege to achieve supremacy over many things. "For behold, this is my work and my glory -- to bring to pass the immortality and eternal life of man." (Pearl of Great Price, page 4). It is decreed that this earth shall become a celestialized, glorified sphere; such is the revealed world. Science has nothing to say on the matter; it can neither refute nor prove. But the Lord, even God, hath spoken -- and so shall it be! Amen.